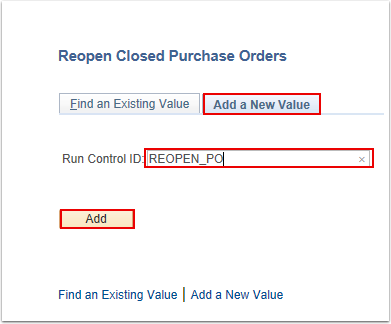 Purpose: To reopen a Purchase Order using ctcLink. ctcLink Purchasing provides the Purchase Order Reopen process to undo changes made by the PO Reconcile and Close process. The process reverses the effects of the PO Reconcile and Close process on the most recently processed group of POs. You run this process to return each PO status to its status prior to the last run of the PO Reconcile and Close process. This does not necessarily mean that running the Purchase Order Reopen process reopens each PO. If a PO status prior to being closed by the PO Reconcile and Close process was Canceled, running the Purchase Order Reopen process on the PO returns the PO's status to Canceled. If the PO status was Open prior to the PO Reconcile and Close process, running the Purchase Order Reopen process returns the PO's status to Open. Consider this scenario: Every day, you reconcile all the dispatched purchase orders by running the PO Reconcile and Close process. This changes the status of all purchase orders to Close. However, now you need to reopen some purchase orders and return the status of these purchase orders to Open. Your goal is to reopen the purchase orders by running the Purchase Order Reopen process. Select the Add a New Value tab. Enter the desired information into the Run Control ID field. Select the Select POs to be Reopened option. This expands a section called Reopen PO Selection Criteria. Select Specific Document from drop down for Reopen Request. Enter Business Unit and Purchase Order ID. Select Accounting Date Option based on your requirement. If you get a message saying "Reopen Associated Requisitions? must be checked when Commitment Control is enabled," click on OK to acknowledge message. 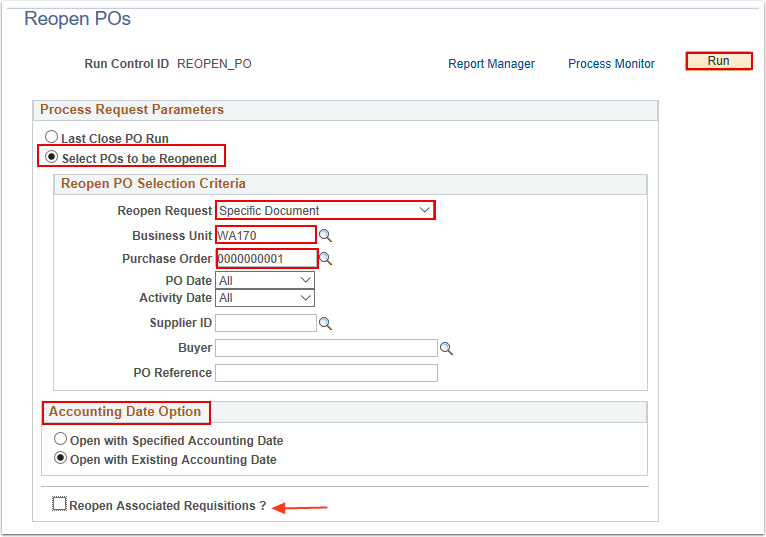 Then check the box near the bottom for "Reopen Associated Requisitions?". Notice that the Process Instance number appears. This number helps you identify the process you have run when you check the status. Select the Process Monitor link. The current status of the process is Processing. The process is finished when the status is Success. Continue to select the Refresh button until the status is Success. 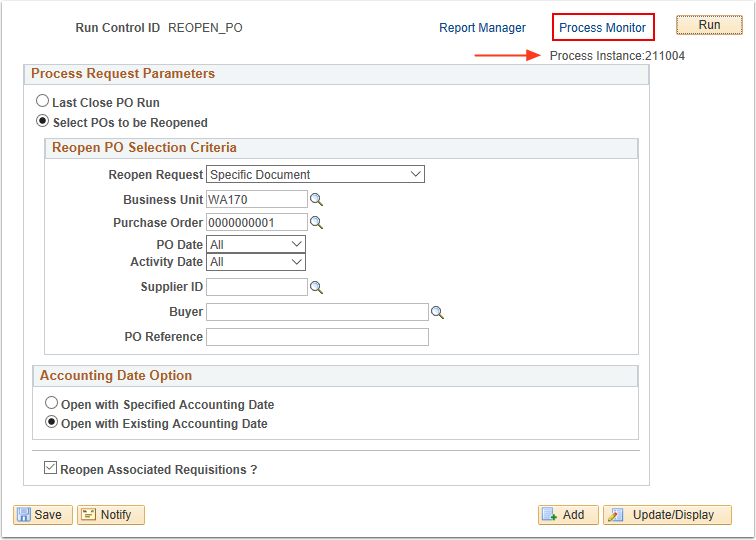 You have successfully run the Purchase Order Reopen process to reverse the effects of the PO Reconciliation process based on your chosen parameters.